forbin wrote: Many pics in this configuration with 2 AIM-9X can be considered stealth as it ? 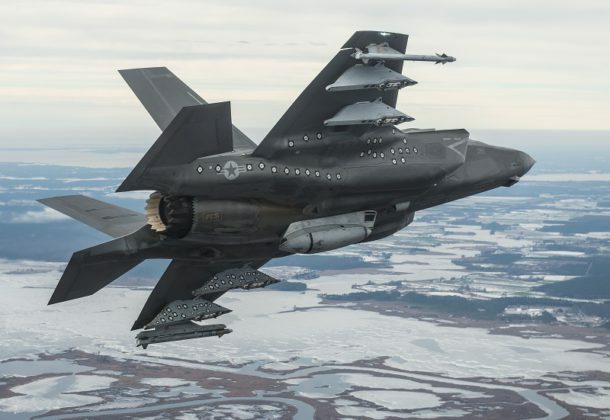 If you are asking whether the F-35 retains its VLO characteristics when carrying two AIM-9X, I think the general consensus around here is that external AIM-9X carriage degrades VLO by some amount, but by how much, no one knows, and those that know aren't saying. 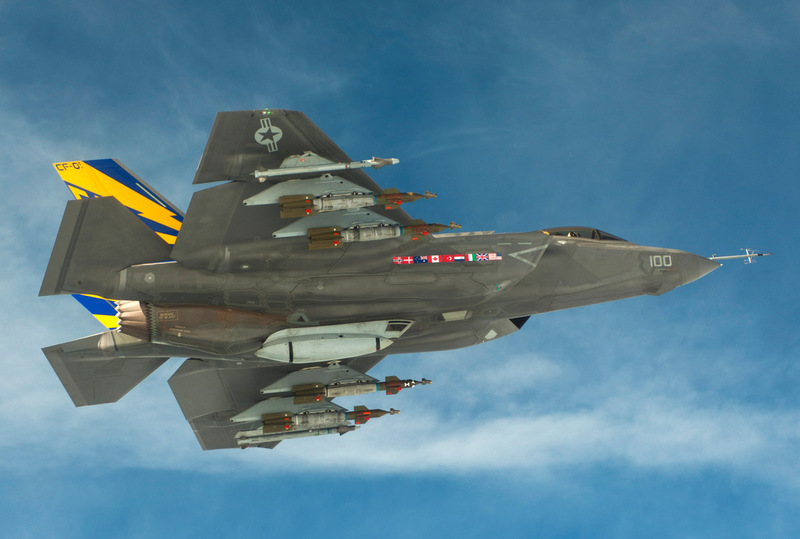 Some have said the F-35 is "still stealthy", or "must still be stealthy or else XYX..." but no one knows for sure, and no numbers have been thrown around, let alone quoted. forbin wrote: The gun had a problem internal not or less in pod fired too on the side fixed now ? Is English your native language? I don't ask this to be rude, but I do not understand this question at all. Photos show Marines F-35B aircraft carrying the external gun pod during exercise off the coast of Djibouti. 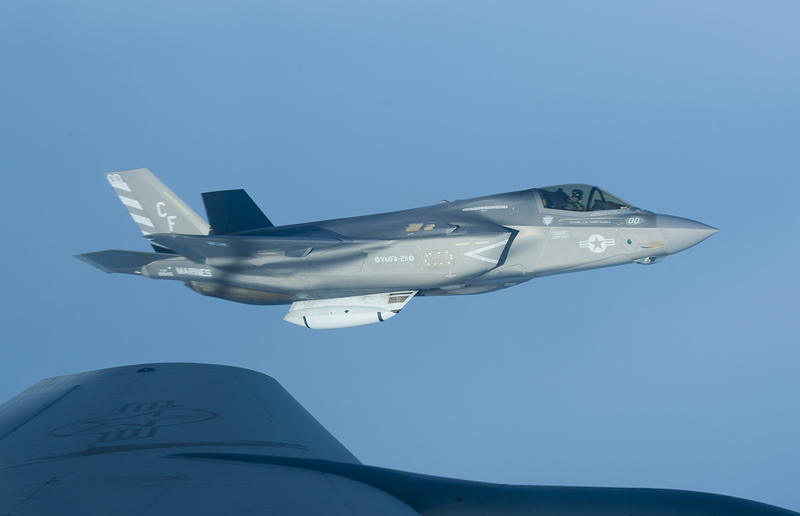 For the last two weeks, U.S. Marine Corps F-35Bs assigned to the Marine Fighter Attack Squadron (VMFA) 211 “Wake Island Avengers”, deployed with the 13th Marine Expeditionary Unit, have undertaken the type’s first operational deployment in international waters off the coast of Djibouti. Beginning on Sept. 8, the aircraft have taken part in a Theater Amphiobious Combat Rehearsal (TACR) operating from the flight deck of Wasp-class amphibious assault ship USS Essex (LHD 2), deployed to the U.S. Central Command area of responsibility near Horn of Africa along with the rest of the Essex Amphibious Ready Group, that includes the San Antonio-class amphibious transport dock USS Anchorage (LPD 23) and Whidbey Island-class amphibious dock landing ship USS Rushmore (LSD 47). Why are the gunpods painted white? I would think you'd want a grey to match the aircraft? There's some blue-biasing and brightness in the pretty images that's washing-out the grey color of the pod. It's since been marketed as a multi-mission pod. Just a mock-up but you get the idea, multiple role options. The new General Dynamics GAU-22 25mm gun pod uses a unique four-barrel configuration that was developed from the highly successful five-barrel, 25mm GAU-12/U gun also built by General Dynamics. 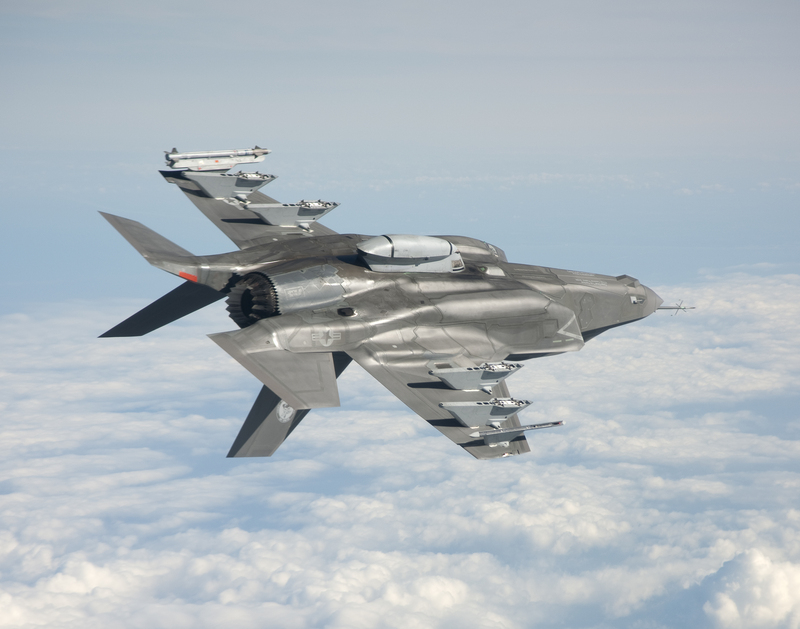 Noteworthy, although it was designed with LO (Low Observability) characteristics, the external pod degrades the F-35’s radar cross section making the 5th generation aircraft more visibile to radars. Still, this should be acceptable (as it is for the non-stealthy AV-8B Harrier jets they will replace) for the scenarios where the U.S. Marine Corps F-35Bs will be called to carry out CAS missions (read here about the so-called “third day of war” configuration). The first fotie has the Bee formating on photie taker so the control surfaces could be everywhichwaybutloose temporarily. I'm guessing incorrect film/digital camera setting/maybe iFone? for 'high in the air' BRIGHT SUNLIGHT photos or rongfilter was used to mess up the colour space but whatever. Second photo is perhaps more towards a correct colour but BRIGHT. Also the photo is taken thru the filter of the tanker window covering which does not help - amateurish stuff really. spazsinbad wrote: The first fotie has the Bee formating on photie taker so the control surfaces could be everywhichwaybutloose temporarily. Formation flying not withstanding... at this lower airspeed, am guessing that the flaperons may be used more for roll control than the slabs? But I considered both photographs, and they both seemed to suggest positive incidence for the stabs. Just more "evidence" (?) of the unstable static characteristics of the design and that by having all aero surface generating lift, drag is minimized. FWIW. 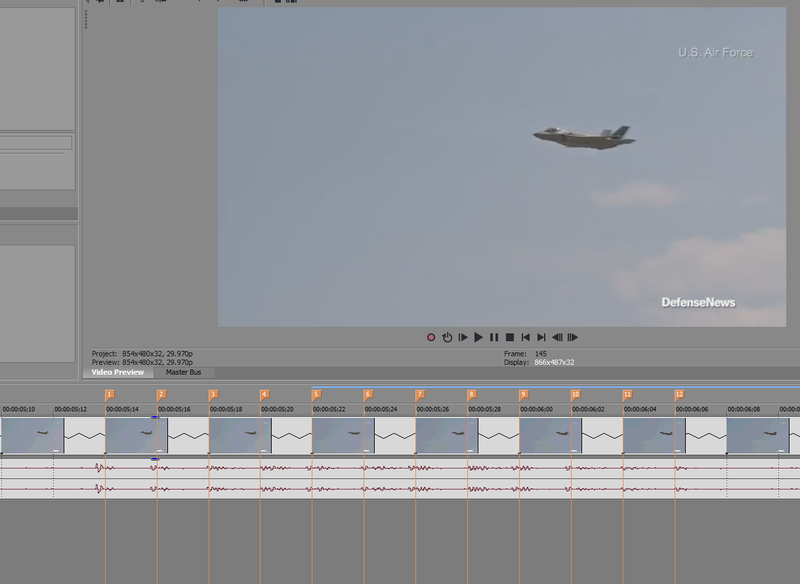 The gunpods in that video and still frame posted by spaz sure seem to be much closer to the color of the F-35B than the ones I posted from the aviationist up above. This Nammo APEX ammunition impresses me the more I learn of it. I know the US has developed their own rounds via ATK (now part of Northrop Grumman), but I wish the US had simply contracted with Nammo. The burst length is selectable. The pilot isn't "free gunning."